Every year we face the same challenge that comes with the holiday season – keeping our costs under control. It’s not always the easiest thing to do, and with all the extra holiday temptations it only gets harder. It’s traditionally the most expensive time of year for families, and while this can’t easily be changed it doesn’t have to mean that things are unbearably expensive or that money can’t be saved. 1. Buy Early: One thing that we often do is leave our gift shopping until the last minute. This can cause a few problems that lead to us spending more money than we would otherwise have to. Prices for popular gifts like toys often go up around the holiday season. Buying things early means avoiding the price hiking. Another problem that late shopping can lead to is less choice. The longer you leave it, the less popular products there will be available. This means that last minute shopping can force you to buy things that you otherwise wouldn’t – things that may well be more expensive than the alternatives that are no longer available. 2. Wait Until After The Holidays: In some cases, it’s possible to wait until after the holidays are over to buy gifts. This is a good idea, as there are often New Year sales at massively reduced prices. It can actually be frustrating to find something you bought just days earlier at half the price in the sales that come once the festivities are over! 3. Make Gifts: Gifts don’t have to be bought, and traditionally many holiday gifts have been home made. There are loads of things you can make, but obviously not all of them can necessarily replace typical gifts like stereo systems and so on. However, small home-made gifts can replace a lot of the lesser gifts that we buy each other just to bulk up the amount of goodies that we give. The best thing is that these gifts are often treasured, as people appreciate time and effort that you’ve spent making something just for them. 4. 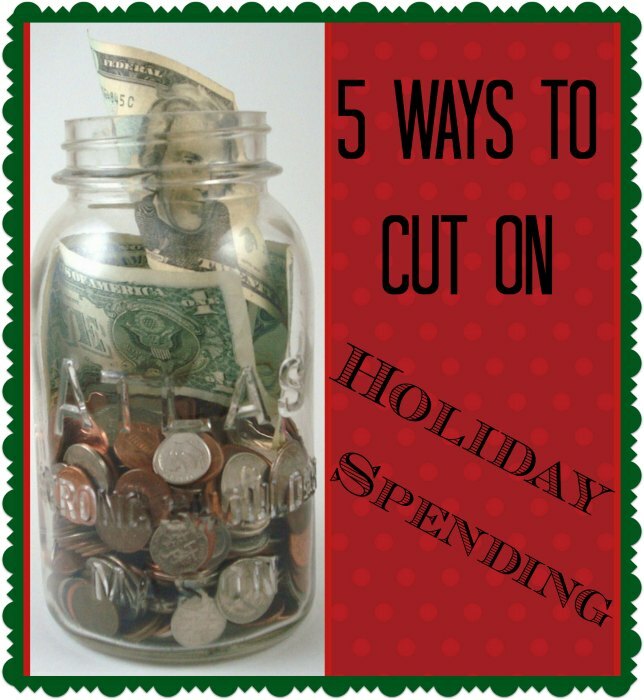 Cut Back On A Few Luxuries: Another easy way to help control holiday costs is to cut back on luxuries in the last months leading up to December. Don’t buy all the luxury foods or other products that you usually would. Buy the budget shampoo and shower gel for a few months instead. Little things like this can make you quite a big savings, and this money can then be put toward holiday expenses instead. 5. Shop Online: Shopping online is quickly becoming the most popular way to buy products, and not without good reason. Although it doesn’t give you the chance to get a hands-on experience with things before you buy them, it lets you compare prices and shop around very conveniently. Bargains are to be found everywhere on the internet, and if you plan ahead you’re even more likely to find some real cost cutting options. Even major gifts like televisions and games consoles can be found for really good prices if you search around with online retailers. Just be sure to pay attention to return policies, as they can seriously differ from site to site. Great ideas, I might have to remember idea number 2 if things work out with my disability case. I do most of my shopping online. I don’t usually buy the kids clothes because they are older and prefer to pick out their own stuff, so I’ll just give them gift cards for that kind of stuff. The other things they want I can comparison shop with online! Some great ideas.Thanks for sharing. Last year, I gave gifts to about 15 people and spent a total of less than $200. Another gift saving tip is reusing or regifting. I know it’s a faux pas for a lot of people, but if you aren’t going to use it, doesn’t mean it’s not a good gift. I’m not saying regift the ugly Christmas sweater, unless you’re into that, but say you receive a nice bowl, but you have no use for it, go for it! Thanks for sharing and linking up with Countdown in Style! Don’t forget to come back on Friday to see if you were featured! I love the tip about making your homemade gifts. I truly want to try to get into doing that. I think if I do it earlier rather than rushing around last minute (like I always am), it can actually be a reality for me. By the way, you’re this week’s featured link for Save Money Monday! Thanks again for submitting your fabulous post! I really like the handmade and am so working to where I can work all year long on making things by hand to give as gifts. 2014 here I come!